3 Bdrm/ 2 bath home with Foosball and Hot Tub! Located in Montgomery Estates! 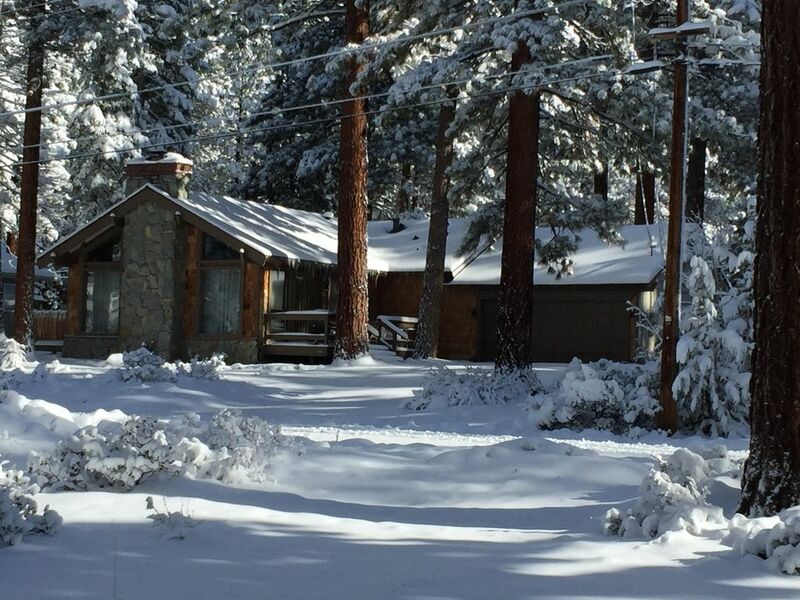 The Tahoe Ski Chalet is a lodge-style home, with three-bedrooms, two-baths and it sleeps eight. It features an over-sized great room with a vaulted ceiling, a gorgeous used-brick FIREPLACE, and an antique Conestoga wagon wheel chandelier. After a long day on the slopes, washing coins in the slots, or shopping the outlets, the experience of sitting in front of the fireplace with a glass of wine or a mug of hot chocolate just can't be beat! The FOOSBALL TABLE is there for hours of entertainment!! When it's time to "veg out" and watch a movie or football game, you'll be impressed with the 50" HD FLATSCREEN TV. The home is centrally located within five to seven minutes of world-class skiing, casinos, restaurants -- and, of course, beautiful Lake Tahoe. The home is tucked away in a quiet neighborhood, protected from traffic and tourist noise; and it's less than one block from a national forest preserve which is perfect for hiking and biking in the summer. For the avid hiker, there is a gorgeous view of Lake Tahoe from the top of the hill. On your way, you'll come to a meandering stream -- complete with falls, where the kids can enjoy water fun while the adults enjoy a picnic lunch. It's perfect for those educational nature hikes. In the winter, many use the same area to go snow shoeing or cross country skiing. After a long day of sporting activities or shopping at the outlets, try relaxing in the soothing HOT TUB, or lounge on the chalet's large deck while cooking steaks on the gas barbecue. If you prefer to cook inside, the kitchen is fully stocked with microwave, dishwasher, pots and pans, dishes, etc. All you have to do is buy the food. And when the day is done, each of the 3 bedrooms have comfortably appointed KING SIZED BEDS and 32" FLATSCREEN TVs. You'll enjoy the sounds of nature in this truly peaceful setting and home. Enjoy the mountains and the forest! Outside adjacent to the deck. Great place for a great price. Clean, cozy, plenty of space and a hot tub. All we needed for our snowboarding trip. Location was excellent too. Minutes to the California lot at Heavenly, and about an hour to both Kirkwood and Northstar. I'd definitely stay again. Was clean, easy to find and excatly as pictured. i was more than pleased with the rental at Talbot street. We had too much snow, but otherwise this property was as advertised. Clean, warm, lots of kitchen supplies, great fireplace, hottub and television. Most importantly I had frequent communication with the owner and she was most accomidating and helpful to make our stay outstanding. I highly recommend this home as it was my home for a week. Couple of plumbing issues and the coffee pot needed replacing, but they were very quick to respond to our concerns and should be fixed for the next guests. Hot tub was great, beds were comfortable, and fireplace was wonderful. Not the newest house or decor, but we had a great stay. Great place, great location, everything someone needs..
Let me start with the few positives. The house is easy to find and located in a very nice neighborhood. It does provide a roof over your head for your stay. Other than that, don’t expect much. We spent a week prior to our trip trying to reach the owners in order to get the door code.Multiple voicemails were unanswered. Two days before our trip I contacted VRBO and they couldn’t reach them. On our way down, I finally received a voicemail with the door code and a request to call her back. I tried calling countless times throughout our stay. I was never able to reach an owner. The moment you drive up, you notice that this is the most rundown house in the neighborhood. The porch is very old with a door mat covering a rotten board, watch your step. The house is very outdated and also, was very dirty, cobwebs, inches of dust on the carpet, food and dirt in the cupboards, dishes in the cupboards had food film in them so we had to wash everything before use. The dish soap provided was so watered down it took a ton to get anything clean. Multiple shelves in the fridge are broken and fall off if you put anything in them. The beds are hard and uncomfortable. The dining room table is completely uneven and tippy. We ended up using cardboard from soda boxes to even it out for our stay. The screen door is broken and shredded, watch your fingers.I don’t know how to describe the access to the hot tub except for a pile of bricks, completely unsafe and surely not code. The hot tub itself did not smell clean. We did not attempt to use. The laundry room floor feels unstable under your feet. On the last night of our stay, a water main broke and we were without water most of that night. Still unable to reach the owner, we contacted the water company ourselves for help. This was our first time renting a cabin. It was a complete let down. The price seems right but save yourself the heartache and spend a little more. I took a pictures to post with this review, however I don’t see where to upload any. This is a shame because the photos that are posted are deceiving. This home is located in South Lake Tahoe, California, which is within minutes of Lake Tahoe, Heavenly Valley, Sierra at Tahoe, Kirkwood, Harrah's, Harveys, Horizon, Caeser's and Lakeside Inn gambling casinos. The home itself is located in popular Montgomery Estates, off Pioneer Trail, which is only 5 minutes from Heavenly. The area is surrounded by National Forest and is great for hiking, mountain biking and snow shoeing. It has a lovely neighborhood and is very peaceful and quiet.